The more I work with the Babylock Embellisher the more excited I become regarding the potential that these types of machines hold for fiber artists, quilters, and artisans. Every thread, yarn, fiber, and fabric becomes the basis for experimentation, producing unique results that cannot be produced by other means. But I digress. . . In part one I promised to share with you a technique that I call “shadow felting,” since the resulting fabric takes on a suede-like appearance and renders a muted form of the original base fabric. 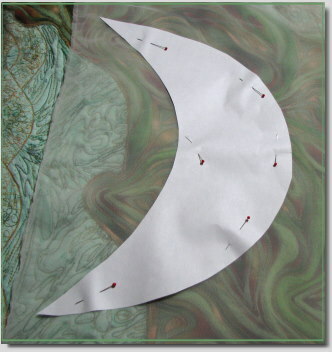 Also, when used as a 3D object on a quilt or other project, it casts a shadow. 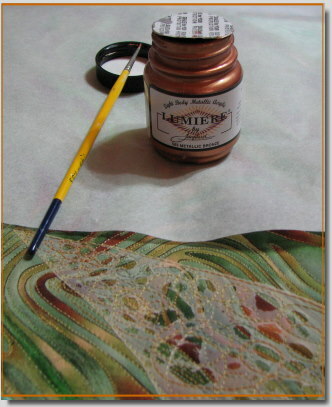 For the best results with this process, you will need a batik, a hand dyed, or a hand painted base fabric that has individual motifs you can use for appliqué. Using a one-sided commercial fabric doesn’t work well owing to the pale underside that obscures the original design when needle felted. 1. They are both very lightweight. 2. The Carriff stabilizer will remain in the project, adding strength and a good foundation with which the fibers can mesh. Its non-woven wispy appearance also mutes the surface ever so slightly. 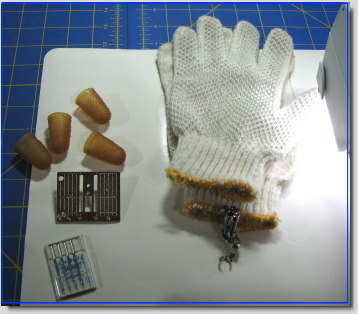 If neither of these products are available to you, try a very light weight used dryer sheet (some are too dense) or a water soluble mesh stabilizer such as Vilene. I haven’t experimented with the wash-aways because they involve the extra step of removal, but they should work. Begin by hooping your stabilizer and placing a cut motif on top. If one side of the design motif is more pronounced, place that side face down. 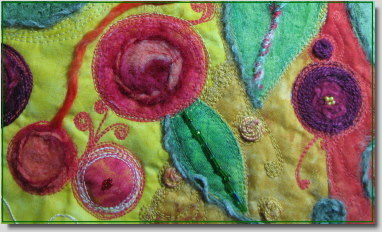 Starting in the center, tack the motif to the stabilizer and needle felt the entire motif. It only requires a light felting. Next, place a small amount of roving on the surface of the motif. Again, start in the center and needle felt roving over the entire design motif. 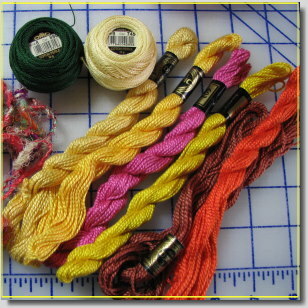 Use a roving that matches the color of your motif. You may also like to mix in other colors that blend well. For example, I added a darker shade of green on one of my leaves. Make sure you felt the edges of the motif adequately. Check the back side (which will be the front side when you’re finished) to see if more felting is required. 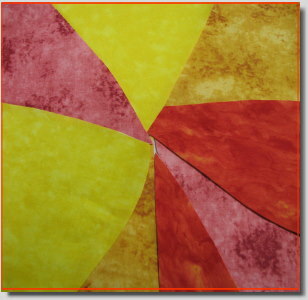 The goal is a motif with a suede-like appearance. Make sure enough roving has meshed through to produce this look. 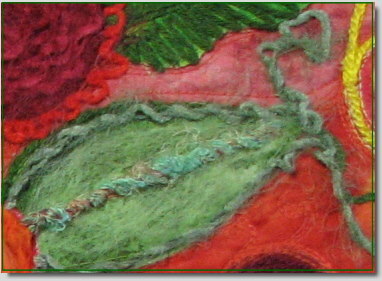 When your motif is completely felted, remove it from the hoop and cut away the surrounding stabilizer. Set your iron on the “cotton” setting. Sandwich your motif between nonstick pressing sheets (or parchment paper) and iron on both sides. Let the pressing sheet cool and then take a peak. The Carriff motif should be ready to cut. The EZ-liner may take a few more seconds to melt. As an alternative, you can melt the EZ-liner with a heat gun set to its lowest heat setting. 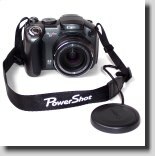 Do this outdoors if possible, but always in a well ventilated area. Do not place the gun too close to the motif and keep it moving across the surface until you see the liner begin to melt. Regardless of which method you use, a quick pressing flattens the motif (to about the thickness of craft felt) and helps to set the fibers. Now you are ready to cut your motif with a sharp pair of craft scissors. I placed my leaf motifs here and there on the surface of my quilt. 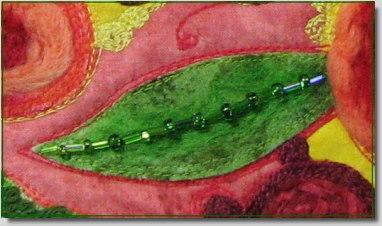 I chose to appliqué two of the leaves, simply doing a few rounds of straight stitches. When the sewing machine needle punctures the edge of the “shadow felt,” a slight bit of fraying takes place. However, on the leaves that I applied as 3D objects (with stitching on the interior of the leaves), there was no fraying. Notice the difference in appearance between the thread painted leaves and the appliquéd/3D leaves. They all share color and shape similarities, yet they each have unique properties that add visual interest to the whole piece. I hope you enjoy playing with this technique and discovering new possibilities for your work. Relax and have fun! 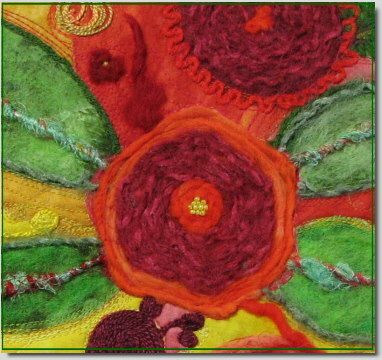 Being relatively new on the scene, machine needle felting holds many secrets yet to be revealed. By experimenting with various fabrics and fabric combinations, one can discover some very exciting things. In part one, I ended with the light green on dark green organza fabric. 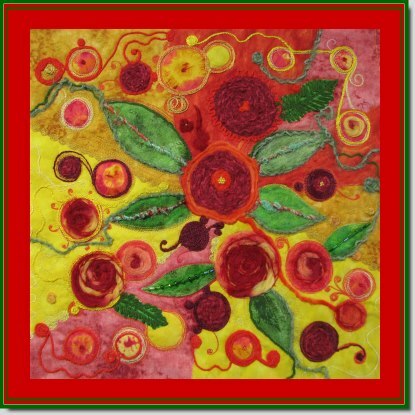 The first time I mixed the two colors and saw the resulting texture on the back side, I knew I had discovered a technique that could be used in art quilts and more particularly in landscape quilts. 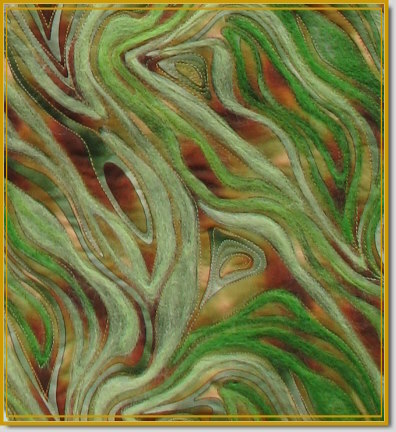 The appearance of this new fabric resembles the mossy looking growth on old tree trunks or rocks. When ironed, it flattens out a little and makes a great fabric for leaves. It can be stitched, appliquéd, or used for 3D objects. Owing to its inherent sparkle, I believe it would also make wonderful insect wings, animal fur, and other such items. Such a promising fabric deserves a name, don’t you think? Maybe I’ll call it “Noah” cloth since the first thing I made with it was an olive leaf. On the piece where I used the Carriff .50 stabilizer (used dryer sheets really do have a similar appearance to this product), I decided to go a step further and see how the Noah cloth handled fabric paint. Using a small amount of pernod Setacolor paint (transparent) mixed with water, I dabbed areas where the stabilizer peaked through. After it dried, I ironed the piece again (to set the color) and noticed that the paint had removed the sparkle from organza, providing me with more options to play with in the future. As we saw in part one, the nature of polyester organza changes under the needle. In its original form, it is very sheer, unruly, and frays easily. After being needle punched to a light stabilizer, it loses some of its transparency, behaves beautifully, and becomes a non-fraying fabric. Additionally, organza can be used as a base fabric for other felting projects, which it what we will turn to now for the fluffy pink flower. First, hoop a piece of organza whatever color you would like your flower to be. Place a small amount of wool roving on top the hooped organza. I like to pull it apart and fluff it out so that there are no heavy areas. 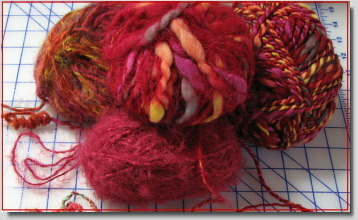 Beginning in the middle, slowly tack down the roving. 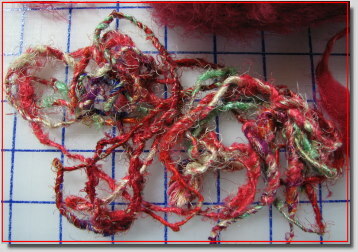 After the roving is secured, give it a more thorough felting, making sure you have covered the entire surface. Returning to your Embellisher or needle punch machine (you could also use a hand needle punch), take one petal at a time and very lightly felt a small amount of roving across the surface. 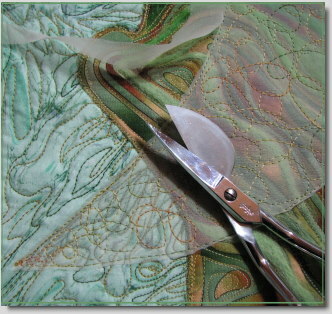 Do this very slowly and only allow the needles to punch the fabric a few times in each spot. The goal here is to have a fluffy dimensional petal. Also, it helps to roll your roving into the shape of the petal before putting it under the needles. You will now have five petals with a fluffy loft to them, ready to become a flower. For the center core, I used a small round piece of felted organza left over from the project in part one. You could just as easily use a piece of craft felt. To aide in the flower’s symmetry, dab a tiny amount of fabric glue on the back side of the inner points and positioned them evenly around the yellow circle. 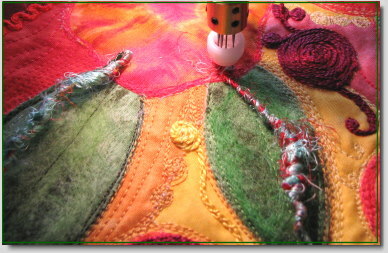 Next, turn the flower over to the back and needle punch around the yellow circle, securing each of the five petals. You may like your little flower just as it is at this stage, or you may like to embellish it further; the choice is yours to make. 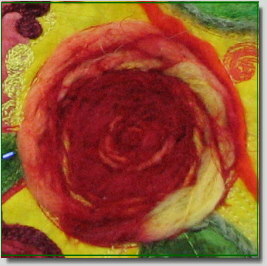 However, if you used a piece of felted organza for your center, observe the effects on the front of the flower. Notice that the organza fibers felted through to the front of your flower and graced it with their sparkle. To complete the flower as pictured in part one, take a small amount of yellow roving, form it into a little ball, and needle punch it in the center front of the flower. 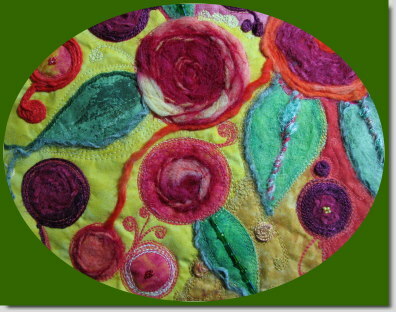 As a finishing touch, sew some seed beds around the circumference of the center. You now have a lovely little flower that will add beauty wherever you plant it. There were a few other serendipitous surprises as I worked with various fabrics. I’ll be sharing these with you in the near future so stay tuned.